Planning a New Year’s Eve get together? Well, let this list of 50 game ideas help you pick just the right activities to make your party perfect! Disclaimer: This post contains affiliate links. To learn more about ’em, click here.We want your planning to be as easy as possible, so we have rounded up some amazing games just for you! 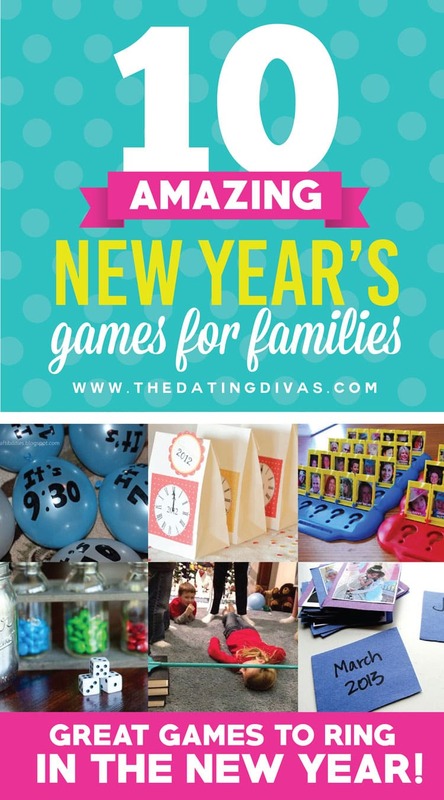 Use one or more of these fantastic games to help you and your guests have a blast at your New Year’s bash! 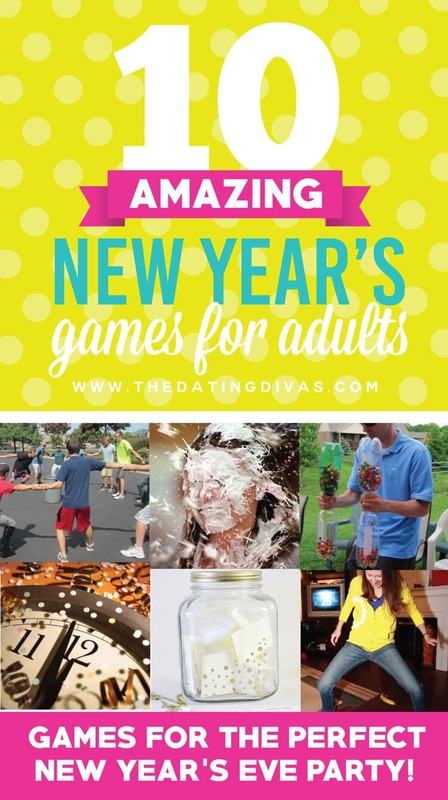 *Have fun with your family using these great New Year’s games. * 1. 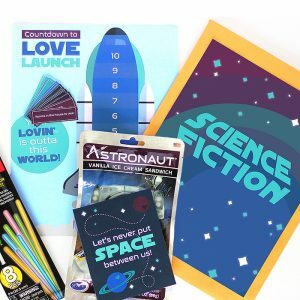 Countdown Bags – Get paper bags and fill them with fun things for you and your guests to open on every hour of the night. This is a fun New Year’s game for all ages! 2. Slide Under the Broom – For this fun game, put a broom across 2 separate stacks of books and slide under it. If you knock the broom off the books, you are out. After each player has taken a turn, take a book off each stack and play again. Repeat. The winner is the last person who is able to slide under the broom without knocking it off. Fun! 3. 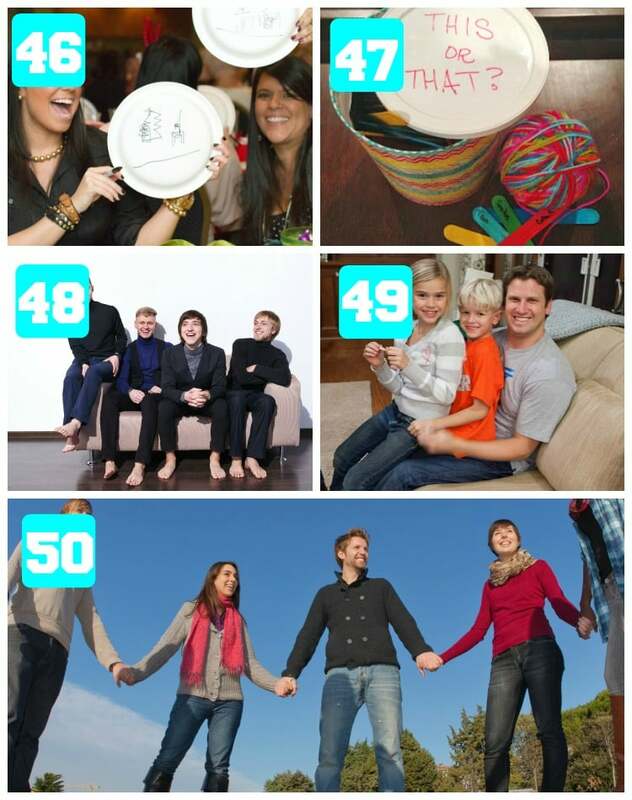 Picture Scavenger Hunt – Print off pictures that you have taken with your family throughout the year, hide them all over your house (or any other designated area), and send your family or guests on a scavenger hunt to find the pictures. This is a fun way to look back at (and remember) great memories that happened through the year during your New Year’s party! 4. Family Guess Who – Get a game of Guess Who and replace the game pieces with pictures of your family. 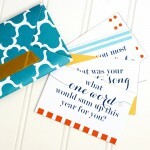 Guests at your party can take turns playing this fun and personalized game! 5. New Year’s Tree – Fill balloons with money or trinkets to turn your Christmas tree into a New Year’s tree using the items (sparklers, New Year’s party hats, or glasses). Your tree now has all the items you will need to make your celebration at midnight perfect! At midnight, pop all of the balloons, light your sparklers, wear the hats and glasses, and take home the small prizes that were in the balloons. What a great way to ring in the new year! 6. New Year’s Ball Game – This is a great game for your New Year’s party. Get your used wrapping paper left over from Christmas (tissue paper and newspaper work great too), some packaging tape, and small gifts, candies, etc. Start making a ball with the items by wrapping the gifts into the paper and securing with the tape. By the end you should have a huge, over-sized ball. Then take turns unwrapping the ball and keeping prizes (the site has all the instructions on how to play the game). With this great New Year’s game, everyone will have a blast and some will even leave with fun prizes! 7. M&M Straw Game – This is a fun and silly game to play at your New Year’s party! Get some straws, bowls, and most importantly – M&M’s for a competition to see who can get the most M&M’s in their bowl. Awesome! 8. 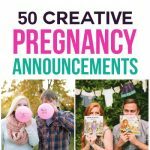 Balloon Pop Countdown – This is another fun version of counting down to midnight. Get some balloons, put papers with designated activities and games to do in them, and pop the balloon at the designated time for some awesome New Year’s fun! 9. Family Photo Trivia – Print off lots of pictures of family outings throughout the year. Then one by one hold up the pictures. Whomever says what event the picture represents gets a point (there are lots of variations on the game). 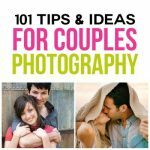 Continue that until you have gone through all the pictures and the person with the most points can earn a small prize. What a fun way to celebrate the year with your family! 10. 20 Questions – This is an exciting game of guessing an item 1 person is thinking about in his/her head in 20 questions or less. 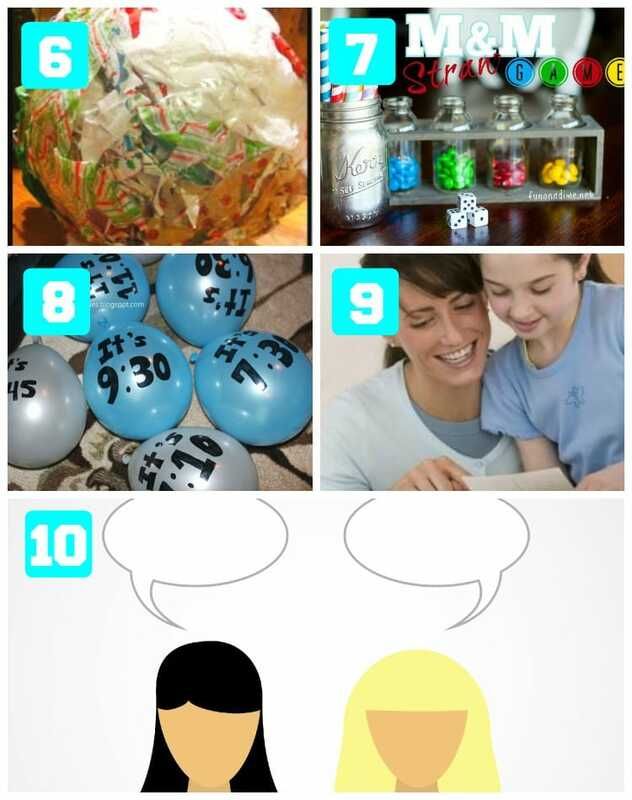 Spice this fun and intriguing game up by having the item you are being asked the 20 questions about be related to New Year’s. It’s a great way to make the game relevant to your party and an exciting way to celebrate life. 11. Marshmallow Hoppers – Cut up some plastic cups, add a balloon and lots of mini marshmallows for ammunition and now your kids will have the best time at their New Year’s party! 12. Eat a Donut Off a String – String up some donuts on a piece of ribbon or yarn, drape it across a large room, and let the kids eat the donuts using only their hands. The person who eats the donut the fastest wins! 13. New Year’s Eve Bingo – Play a fantastic game of Bingo, but mix it up a bit with anything that screams New Year’s – sparklers, party hats, countdown clock, etc. 14. 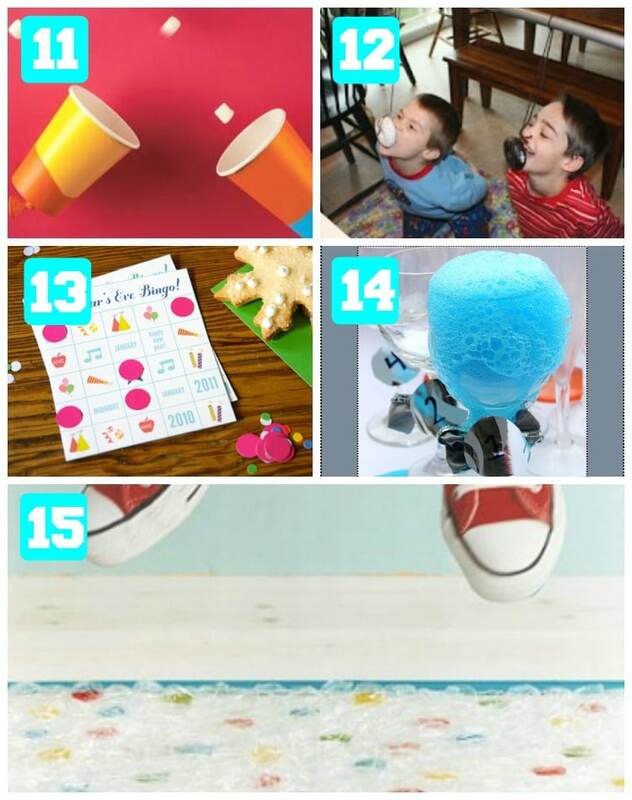 Fizz Countdown – Work your way into a new year with this great science project – turned game! Assign a time that you are going to be creating the concoction and have fun seeing what the kids’ reactions are when it explodes. Awesome! 15. Bubble Jump – Make a fun game out of bubble wrap to keep your kids entertained during your New Year’s festivities. Put the bubble wrap on the floor while listening to music, then jump away while the music is going. Once it stops, the kids have to stop jumping. Whoever doesn’t freeze when the music turns off is out of the game. 16. Rolling Around the Clock – You need some dice and paper clocks to play this game…the first person to 12:00 wins (see the site for more instructions). This is a fun and easy New Year’s game for the children. 17. Marshmallow Game – Have the children at your New Year’s get together transfer mini marshmallows from one cup to another using chopsticks (straws). The winner is whomever can transfer the most in a 1-2 minute period. 18. Balloon Stomp – Tie a balloon to the ankle of each player – then the players try to stomp on each other’s balloons. The person with the last balloon that didn’t get popped is the winner. What a fun game to play! 19. Popcorn Olympics – Use popcorn in a variety of fun games for your New Year’s party this year. They will all be a hit for sure! 20. 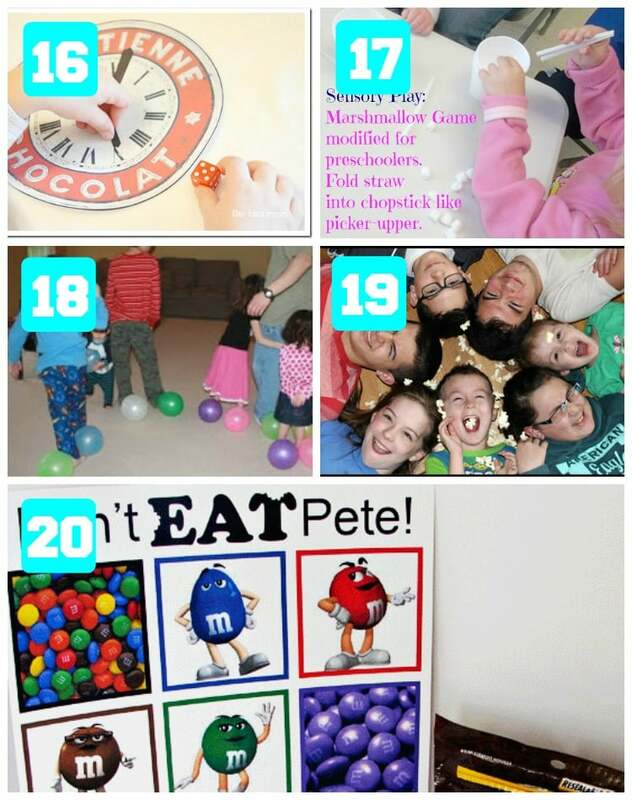 Don’t Eat Pete – Have the kids play a fun game with M&M’s using the instructions provided in this post. The kids can’t eat a certain M&M and if they do they are out of the game. This game is exciting and yummy! 21. Guess the Resolution – As your guests arrive to your party, have them write down a New Year’s resolution and put it in a bowl. 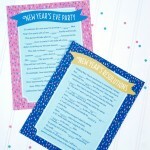 Later on in the party, have your guests gather together and try to guess to whom the resolutions belong. Fun! 22. Knowing Knees – For this great New Year’s game, sit everyone in a circle with a couple people blindfolded in the center. Have the people with blindfolds respectfully feel all the people’s knees that are sitting in a circle and try to guess who each person is, just by touching their knees! 23. Celebrity Hunt – Give each participant a name of a celebrity on a piece of paper taped to their foreheads. Then each player goes around and asks yes or no questions to other players to try and figure out who their celebrity is. This is a fun and exciting game to play on New Year’s! 24. Telephone Game – This game is perfect for a fun party as it will have all players (and bystanders) laughing by the end! Pass out pads of paper and pens, write down a phrase, cover it, then pass your paper to the next player who then has to draw what the phrase says (check out the site for more in depth instructions). You continue to do this until you get your original pad back. Then you read the phrases and show the pictures to the group. This is a fun and exciting game to play! 25. 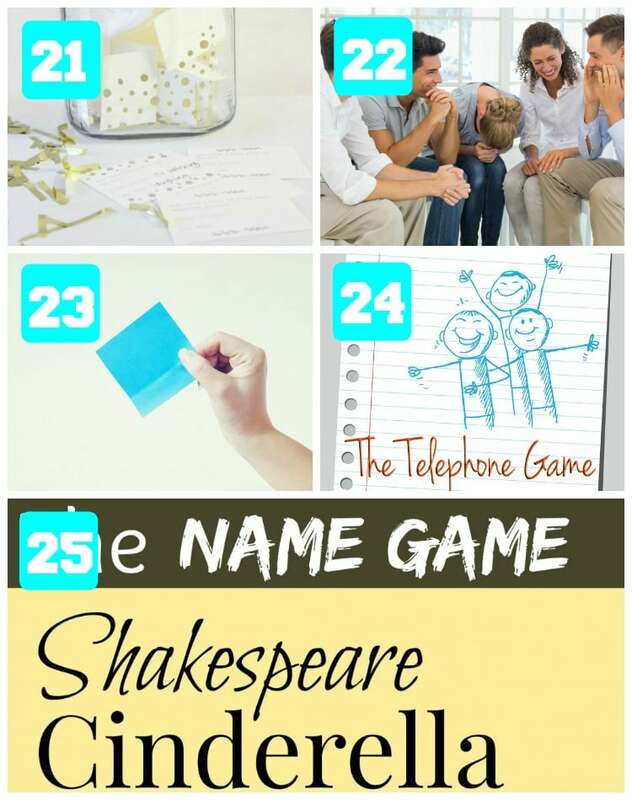 The Name Game – This game combines the fun of Taboo and Charades! It has 4 rounds with each getting more challenging. Sounds great, right? 26. The Shaving Game – If your guests are the adventurous type, then this New Year’s game is for you! Pair up each player, blow up some balloons, roll them in shaving cream, have one player hold the balloon in his/her mouth while his/her partner shaves the shaving cream off – trying not to pop the balloon. You need to have steady hands with this game or – POP! goes the balloon in your partner’s face! 27. Fly Banana – This New Year’s game is a bit on the silly side – so you will have to have players who aren’t afraid of looking crazy to play! Tie a banana at the end of a string to each player’s waist. They then have to roll an orange, using only the banana into the middle of a hula hoop. This game is sure to bring hysterical laughter with it! 28. 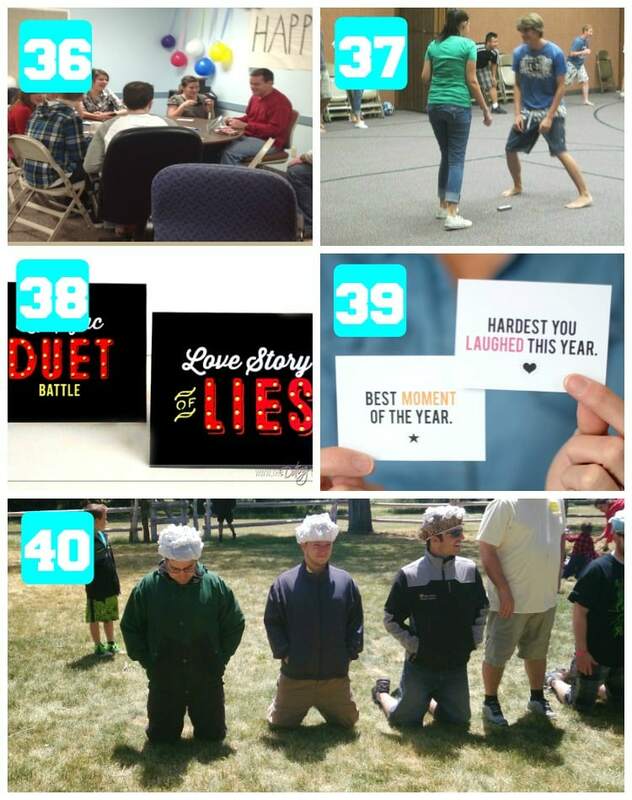 Minute to Win it Games – There are so many varieties of great Minute to Win it games. 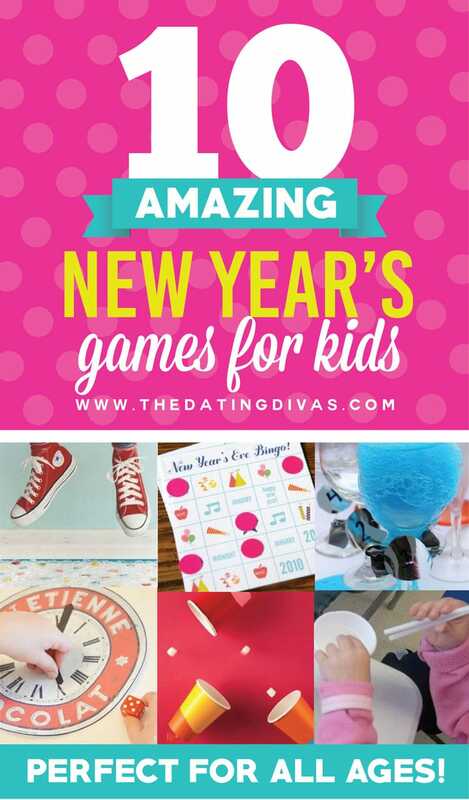 Peruse through a couple different sites to pick your favorite games to play at your New Year’s Eve party! 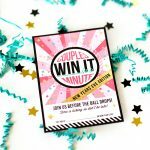 For another option, check out OUR awesome Win it in a Minute group date night. 29. Trash Can – Circle up your guests and put a large (but CLEAN!) garbage can in the middle. The object of the game is for the group to pull one person so they fall in the garbage can. Sounds like a perfectly exciting New Year’s Eve game to me! 30. Mafia – This is a great game to play with a small group of people. Select a moderator (preferably someone who is animated and has played the game before), then deal out the cards to figure out who is who in the game (the instructions explain it in much more detail), then play the game to figure out who in the group is the Mafia. Super fun! 31. Loaded Questions – How well do you know your spouse? 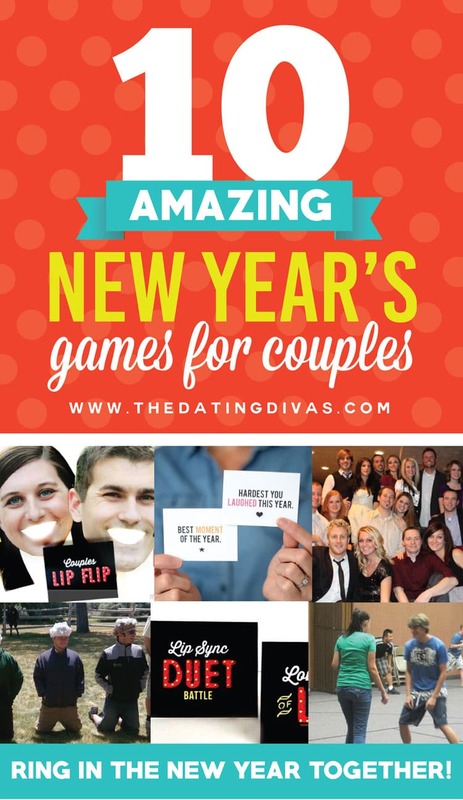 This fun New Year’s game will show you how close you are to your spouse by answering some loaded questions! 32. 2 Truths and a Lie – Have each person stand up one at a time and say 3 things about himself/herself, 2 of them being truthful and 1 being a lie. The group then gets to guess which one is false – the challenge being to try and stump his/her spouse in the process. Sounds like a fun New Year’s game to me! 33. Truth or Dare Jenga – Have a fantastic time with this exciting and hilariously fun game made just for couples! You will be dying of laughter by the end. 34. Cut the Flour – This New Year’s game is fun to play as couples. You pass around a mold of flour with a penny (though you could also use a piece of candy!) on top and take turns slicing the flour, trying not to make the penny fall. The person who does make it fall then has to go search through the flour using only their face/mouth and retrieve it. You can have many molds ready to play to keep the fun going. As a fun twist, the person who gets the penny out of the flour, then gets to give his/her spouse a big huge kiss! Then they both can have nice, white faces together! 35. 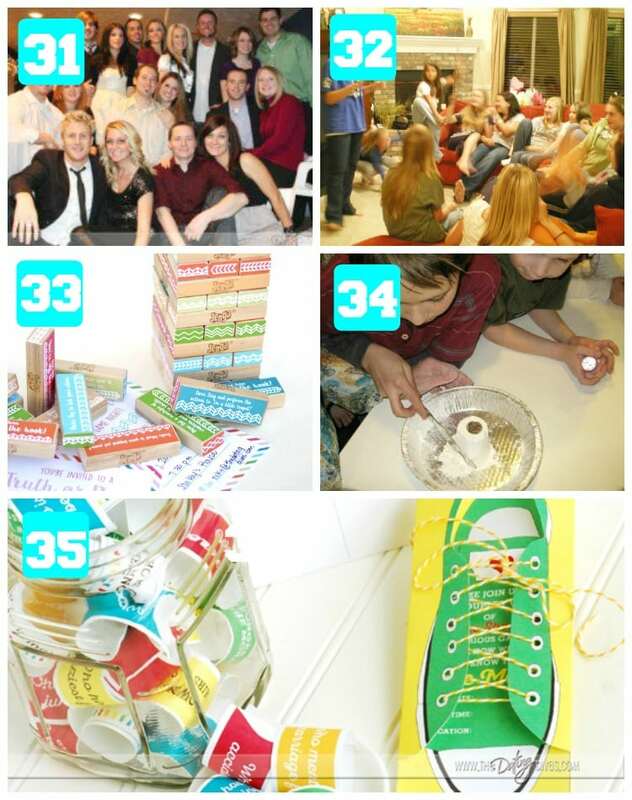 If the Shoe Fits – Play this fun date night game for your New Year’s bash and see how well you really know your spouse! 36. Take a Guess – Have each player write down 3 resolutions they would like to do for the coming year on separate pieces of paper, fold and put into a bowl. Then pull out the papers one at a time, read out loud, and the players write down who they think wrote the resolution. At the end of the game, whomever got the most right wins a small prize. This is a perfect game for your New Year’s Eve celebration! 37. Steal the Bacon – This New Year’s game requires a little bit of room. What you do is put an object in the middle of the room and have 2 people be equal distances away from the object, facing each other, try to take the object and run to their side of the room before the other can stop them. 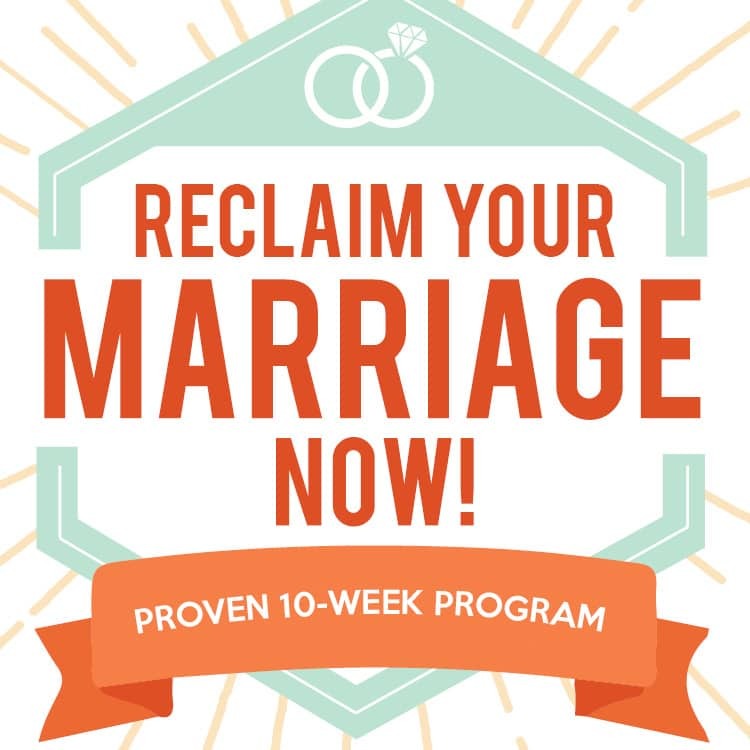 This is a perfect game to play spouse vs. spouse! 38. Date Night Show – If you like Jimmy Fallon and his silly ways, then this is the perfect New Year’s Eve game for you to play! 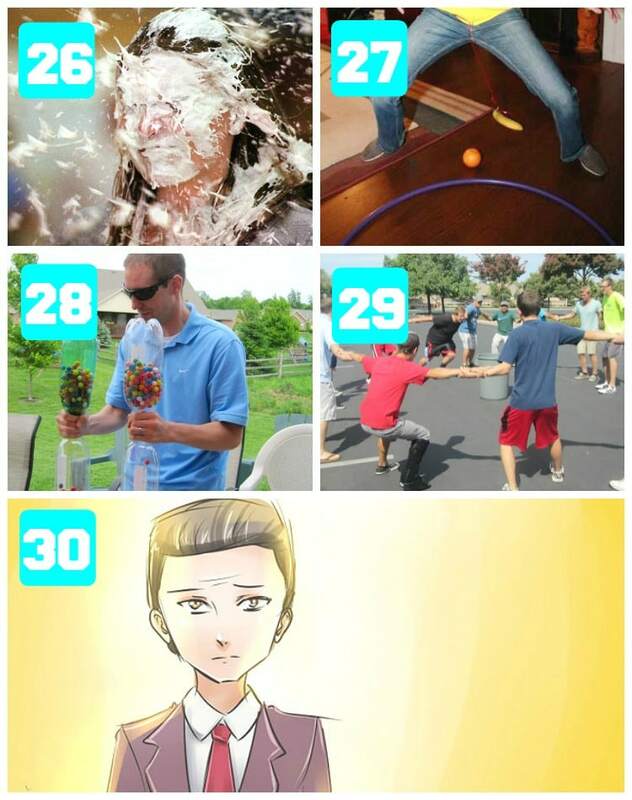 Have a great time playing these games with your guests this year for tons of fun and laughter! 39. 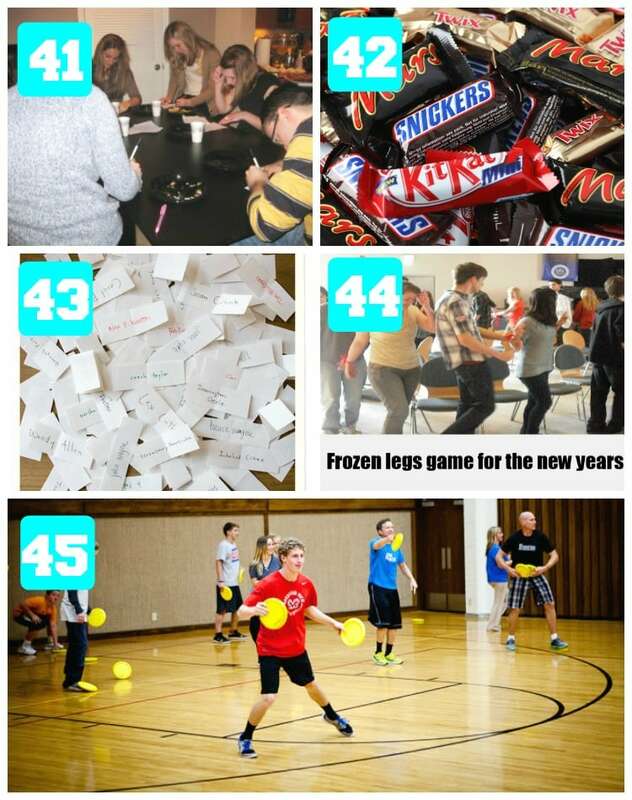 New Year’s Reminisce Game – Print off the game cards that have questions regarding the year on them. 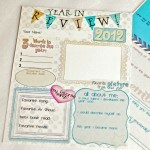 This fun New Year’s game is a great way to reminisce on the good times of the past year before bringing in a new year! 40. Shaving Cream and Cheese Puffs – For this exciting game, you need to pair up the spouses (or however else you want to play), with the brave one putting a shower cap on and spraying shaving cream all over it, and their teammate throwing cheese puffs at them, trying to get them to stick in the shaving cream. Whichever pair has the most puffs in the cream wins! 41. Trivia Games – Trivia games are so much fun to play in big groups. 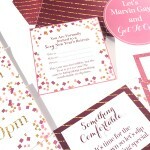 Use one of the fun questionnaires for your New Year’s Eve bash this year! 42. Candy Bar Game – Get ready to laugh your socks off with some candy bars, dress up clothes, a fork, and a knife! Sound interesting? You don’t know the half of it! Be sure to put this game in your New Year’s plans! 43. Name Game – Have your group write down names of people (can be actors, historical figures, people in your family that everyone would know, etc.) on small pieces of paper, fold and put into a bowl. Then split into 2 groups and take turns pulling a paper and try to get your team to guess who the person is. 44. Frozen Legs – This is an exciting twist on the regular game of musical chairs. Turn on some music, and have your players dance around until the music stops. Once the music stops the players have to freeze in the exact position they were in while dancing. Whoever moves is out of the game. Sounds like a great New Year’s game right?! 45. Frisbee Dodge Ball – For this game you need to be in a large space so no one gets hurt. Here you are playing dodge ball but have frisbees instead. Try to throw your frisbees at theopposing team to get them out. If they catch the frisbee you are out, etc. What a fun game to bring in the New Year! 46. Paper Plate Game – Have your New Year’s guests put a paper plate on top of their head and draw a picture following your instructions (can be anything you want). 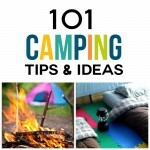 Then devise a point system for those who can draw and follow your instructions the best. 47. This or That – Create a spider web of yarn with this fantastic game! Sit in a circle and pick sticks that have questions written on them. As the questions are answered, the web is created by throwing yarn across the circle. By the end of the game, you should have a huge and massive web and know a lot more about each other! 48. 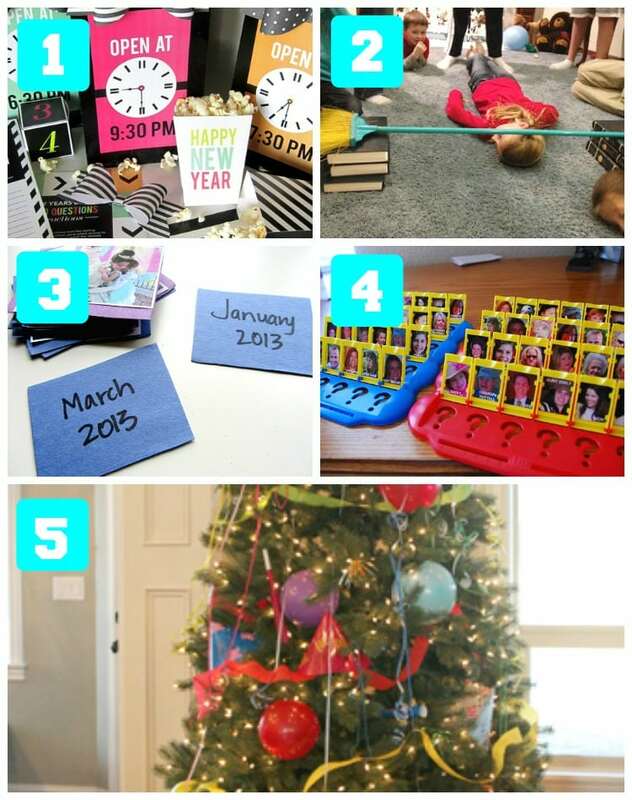 Four on the Couch – Have fun with this fun twist of the game Memory for your New Year’s party. 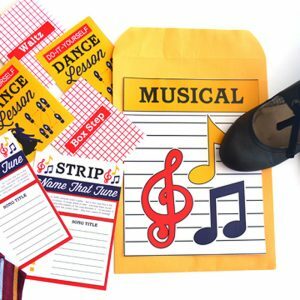 This party game is sure to keep everyone captivated and poised to see who has the best memory! 49. 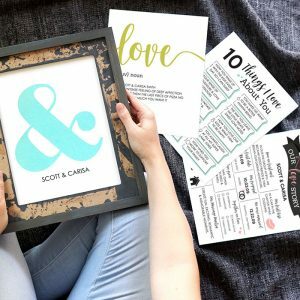 Three Deep – Give each of your New Year’s Eve party guests pieces of paper that will categorize them with others in groups of three. When the game begins, you’ll start searching for your group members, once you find them, you need to sit in the order of your papers on each other’s laps. Those that find their partners last, lose the game. 50. Never Have I Ever – I have heard this game called by many names, the most common being “I Have Never…”. It’s fun in large groups, and you definitely learn a lot about others while playing. One person starts by stating something that they have never done (for example “I’ve never been skydiving”), those people that HAVE been skydiving have to get up and move to a new seat – the trick is there is one less chair than players. The person standing at the end of each round starts a new “Never have I ever…” statement. Did you decide on your favorites, or are there just too many to choose from?! If you like this post be sure to check out these posts from my fellow Divas…Fabulous New Year’s Resolutions Date or send the old year out and welcome in the new with this New Year’s Eve Love Quote. 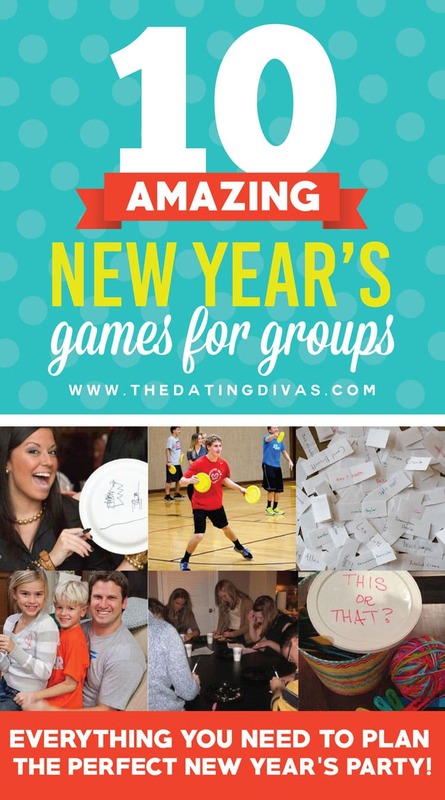 I see that you have included my post about the Name Game in your amazing New Year’s Eve games! That is so sweet of you. Thanks so much. I hope you’ll have a fun-filled New Year’s Eve! Nina- We are glad to use your awesome game idea! What a blast! Thanks so much for your comment and hope your New Year’s was great!